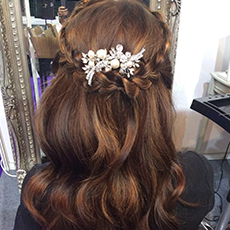 We have been providing wedding hairstyles for brides and bridal parties for over 10 years and know each brides wedding hair is going to be as unique as they are. 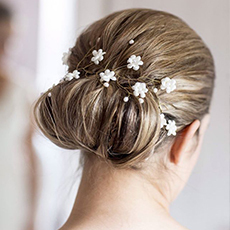 Our wedding hair specialist Rebecca Watson will meet you for an initial consultation at our hair salon in Gosforth, Newcastle and go through your wedding hairstyle ideas. 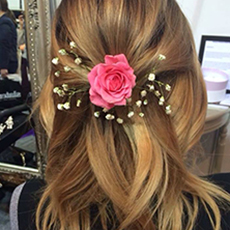 We can arrange a wedding hair trial with you and your bridesmaids to make sure everything is perfect for the big day. 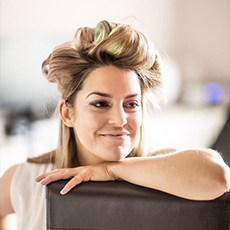 We know your wedding day can get a bit hectic, so we can come to where you're getting ready, whether at your home or the venue. Enjoy a 30 minute informal appointment, where we can get to know you and your aspirations for the big day. We will talk through all your personal touches, such as shoes, jewellery and makeup, ensuring we fully understand the look you are going for. After our discussions, we will propose various options, allowing you to select a final style. At this point, we recommend you book your wedding and trial appointment, which are secured with a non refundable £100 deposit. A dress rehearsal is vital to ensuring everything goes faultlessly on the big day. Using the ideas from the consultation, we can guide you step by step through your chosen style. We will consider every aspect of your style, including height, texture, shape, finish and movement. Bring your personal touches, pearls, tiara etc and we will work on incorporating what you’ve chosen in your final look. 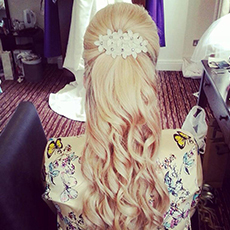 We can give you a tailor made quotation based on your specific needs, such as bridesmaid hair on the big day, call out fees etc. At this point, we are confident that we will create your perfect look for your big day. So you can get ready at a relaxed pace, we can come to you on the morning of your date. Ask our wedding co-ordination for more information on our call out fee for all venues within a 30 mile radius. We can give you a tailored quotation for the wedding party, from bridesmaids, to flower girls, to mother of the bride, our team can cater to all of your needs. We want you to be relaxed and happy, it's your big day!